It is a well known fact that before scaling the walls of multiple story buildings as New Yorks web spinning superhero, Spiderman regularly climbs man made mountains in order to tone his arms and flush out his fear of heights. Overcome your fears, get a great workout, and most importantly do it all while strapped in with a safety harness with today’s TeamBuy: $10 you get an all day climbing pass with all equipment rentals from Vertical Adventures (a $24 value). You can stock up on the deal as you may buy up to 2 vouchers for personal use and the vouchers don’t expire for one year. This is a limited 1-day only sale that will expire at midnight (Wednesday, May 18, 2011). Click here to buy now or for more information about the deal. Quantities are limited so don’t miss out! Winnipeg’s only indoor rock climbing facility. Over 5,000 square feet of intense adventure. Stress reliever and fun workout. Includes an all day climbing pass plus equipment rental (harness, shoes, ATC). 2 per person, others may be gifted. Vertical Adventures is Winnipeg’s first and only complete indoor climbing gym. The facilities are not only designed to test the skills of even the most experienced climbers, but for those of all ages and levels. The Vertical Adventures staff provides professional instruction beginning with basic training, progressing all the way up to lead climber training on routes that will test even the best of climbing connoisseurs. Start at ground level in the bouldering area or find yourself at twenty-five feet on the challenging top-roping walls. Boring is something you will never experience at Vertical Adventures, as all walls challenge your mind and body while increasing flexibility, balance, strength, and endurance. Vertical Adventures has a considerable amount of different top rope routes, with the right level of difficulty for all experience levels. All equipment including harness, shoes, and ATC are included with today’s purchase. The professionally trained, expert staff will guide visitors through climbing adventures and be sure to answer any questions that you may have. Everyone will appreciate the relaxed atmosphere combined with the constant changing variety and challenge at Vertical Adventures. Reminder Update: I originally posted about this deal a couple days ago. Here’s a reminder that this deal starts today and ends tomorrow. 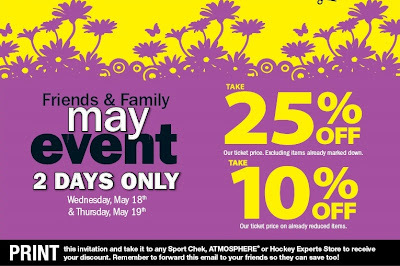 Sportchek has another Friends & Family sales event from Wednesday, May 18 to Thursday, May 19, 2011. This is a 2-day only sale. During the sale, you can save 25% off regular priced items and 10% off sale items. This sale is available at all Sport Chek, Atmosphere or Hockey Experts stores. This sale also applies to all Nevada Bobs Golf stores located inside SportChek locations. To receive the discount, you must print the invitation coupon below below and present it to the cashier. 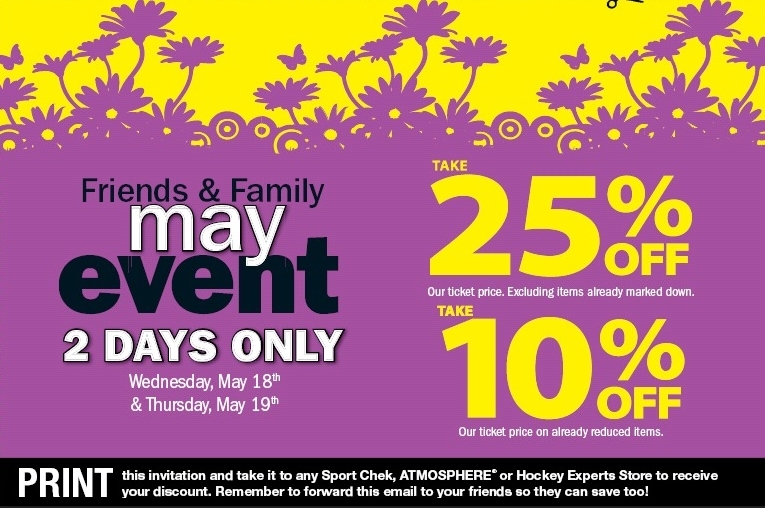 Click here to print Sportchek Friends & Family invitation coupon. 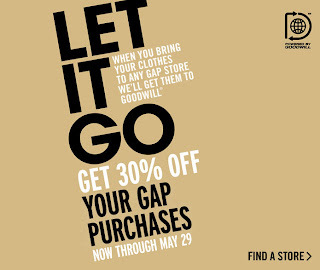 Save 30% off your purchases, from now until May 29, 2011, when you bring in your old clothes to any Gap store. The clothes will be donated to Goodwill. Click here for more information about the offer at Gap. Overnight wilderness getaways are perfect for experiencing the outdoors in their most natural form, or to practice mating calls in the attempts of seducing a googly-eyed black bear. Feed your need for nature with today’s TeamBuy: for $375 you get a four-day, five-night fishing trip escape from Rough Rock Lodge in Minaki (a $750 Value). You can buy one voucher for personal use and 2 as gifts and the vouchers don’t expire until October 09, 2011. This is a limited 1-day only sale that will expire at midnight (Tuesday, May 17, 2011). Click here to buy now or for more information about the deal. Quantities are limited so don’t miss out! 40-horsepower boat with gas and oil included. Serene views of surrounding lake and wilderness. Rustic lodging with complete amenities. Includes a four-day, five-night, fishing trip escape to Rough Rock Lodge. 1 ticket per person. Gift limit 2. Reservation required; subject to availability. Must sign waiver. Must provide own rods, tackle and supplies. Provide own transportation to pickup/drop off points. Extra fee for meals. Gas powered boats included. First 20 litres of gas is free. Taxes not included. The serene sights of the Rough Rock Lodge are not rough at all, rather a calming escape the way nature intended it; just man and the outdoors. Upon arrival to this premier fishing and hunting destination, visitors will experience the true sights and sounds of the sprawling Rough Rock Lodge facilities, which encompasses the only lodging between Minaki and the Whitedog Dam, in the heart of Ontario’s Sunset Country (roughly a 3-hour drive from Winnipeg). Wood-finished lodges at Rough Rock have a true rustic feel to them, many with picture windows and sun decks facing the lake for an invigorating view of the abound landscape. Hot & cold water, showers, bedding, and a number of appliances are all included in these modernized cottages, which create the perfect stay for a night under the stars. Get engines roaring for a day (or many) on the lake with Rough Rocks’ new 17ft deep water motorized boats, complete with 40-horsepower Honda 4-stroke motor, swivel seats, electronic depth finder, and more. Life jackets as well as gas (up to 20 litres) and oil are included with this package deal. Buyers can also expect a lake filled with Walleye, Smallmouth Bass, Northern Pike, and Muskie at this tucked away, calm, secluded bay. This is a limited 2-day only sale that will expire at midnight on Wednesday, May 18, 2011. Click here to buy now or for more information about the deal. Quantities are limited so don’t miss out! Limit 1 per person, may buy 2 additional as gifts. Limit 1 per visit. In-store only. Today’s Groupon: for $25, you get $50 worth of apparel at Mad About Style Boutique on Academy Road. With an acute eye for contemporary style, Mad About Style drapes ladies in casual and professional attire. A fedora cap ($29) shades mugs from judgmental summer rays, and braided wedge sandals ($65) ensure feet are stylishly supported during sidewalk struts. Polka-dotted blouses ($59) dress shoulders up and down for daytime and evening activities, and a flirty party dress ($89) chills fiery evening cocktails. Mad About Style’s obliging staff can eagerly assist shoppers with selecting the right ensemble for their spirit animal. From now until May 18, 2011, save 15% off on Tango and Tango Plus fares to anywhere Air Canada flies. Simply enter the promotion code CN7JV791 when booking, from your city of departure, at aircanada.com. You can travel until November 30, 2011. This offer excludes travel to Europe and Tel-Aviv, and is valid on Air Canada operated flights only (excludes codeshare flights). There is a maximum of nine passengers per booking. Click here to book with Air Canada online now or for more information about the deal.